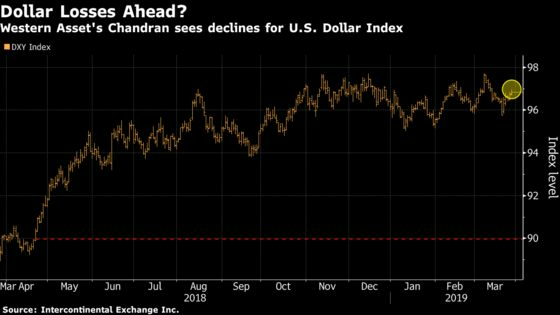 (Bloomberg) -- As investors digest the Federal Reserve’s latest dovish pivot and the inversion of the U.S. yield curve, Prashant Chandran at Western Asset Management sees it all pointing to a weaker dollar and support for riskier assets across the globe. Chandran is co-manager of the $1.4 billion Western Asset Macro Opportunities Fund, which has returned 4.9 percent this quarter, beating about 91 percent of its peers, according to data compiled by Bloomberg. The fund, which pursues “an opportunistic global-macro fixed income strategy,” uses currencies both as a hedge and as a way to bet on a country’s economic prospects. 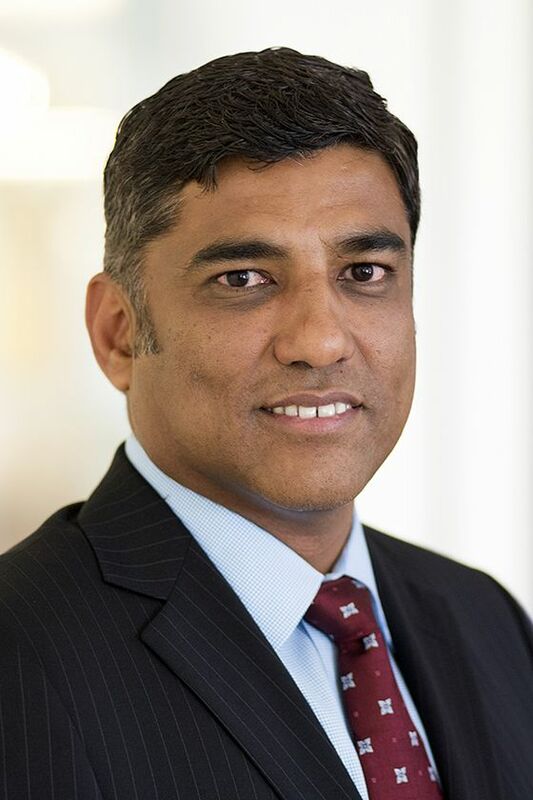 For Chandran, the Pasadena, California-based firm’s head of derivatives, the curve inversion doesn’t signal a recession, as much as it indicates that inflation expectations will remain low. In interviews over the past week, he laid out how he sees dollar declines ahead, which he expects will support emerging markets like Brazil and Mexico. The Bloomberg Dollar Spot Index is little changed in 2019, reflecting a mixed performance by the greenback against its Group-of-10 counterparts. An index of emerging-market currencies has risen about 1.5 percent, with the ruble posting the group’s biggest gain. Following are excerpts of interviews with Chandran on March 19 and 22. What are your expectations for the Fed and the dollar? Our take is that the Fed will not move this year, and perhaps lifts once more when it’s close to the end of 2020. Our base case is that U.S. growth will be lower than expected, but our macro team continues to believe that curve inversion at this time is not really pointing to recessionary fears in the U.S. As U.S. growth moderates, as the Fed has taken on a fairly dovish tone, that really means that the dollar will weaken going forward. Our expectation is that the Dollar Index will weaken to the low-90 range. [Editor’s note: The gauge is currently about 97.] This is a phenomenon that lasts through most of the year. An accommodative Fed lends a tailwind to risk assets, and that is a good backdrop for emerging-market currencies. There are four countries that form the anchor of our holdings driven by emerging markets, and that’s Brazil, Mexico, Russia and India. We keep a medium- to long-term view that these currencies should do well over the 12- to 18-month period. What are some of the drivers for those currencies? For Brazil and Mexico, we find that inflation would fall, policy is shifting along in a positive -- more accommodative -- fashion, and so the goal is to be risk-on in both countries. We still feel like energy prices could move higher with the OPEC cuts. If they are sustained at these levels, that should be good for Russia and the ruble. India is a net importer of oil, so it balances out some of that oil risk that we take on with Russia. India is also growing close to 7 percent GDP. Some election risk, no doubt, but our belief is that the governing party will prevail, leading to continuity in policy and a firming-up in investor sentiment. What’s your stance on the Chinese yuan? The yuan short is one of the smallest shorts that we have, because China has engaged in a decent amount of stimulus. If the stimulative measures start to pick growth up again in China, then that should be a positive. That and a trade deal being announced could both be positive/supportive over the short-term for the renminbi. But nevertheless, Chinese growth and economic fundamentals do pose a risk to our EM holdings, and what we see from a hedge perspective is shorts in the portfolio, short currencies within EM. So you’ll see the portfolio has a small short in renminbi and short in countries that trade fairly actively with China, like Korea, like Taiwan.